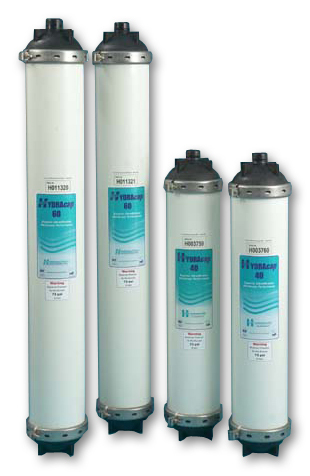 Hydranautics HYDRAcap Series Ultrafiltration Membranes | Applied Membranes Inc.
HYDRAcap is used to treat surface water, ground water, seawater, and waste water as either primary treatment or as pre-treatment to reverse osmosis (RO) and Nano filtration (NF). Compared to conventional pretreatment, HYDRAcap allows higher fluxes for RO and NF systems while maintaining longer intervals between cleanings. In some cases it replaces conventional pretreatment for portable applications, ground water recharging and water recycling. HYDRAcap enhances RO and NF element system design and operating conditions when used as a pre-treatment step for desalination, treatment of surface waters and municipal and industrial effluents. The 0.8 mm HYDRAcap is used for surface water applications containing lower turbidities. The 1.2 mm HYDRAcapLD offers a 50% larger capillary diameter for a wider range of high fouling applications.